XCode lets you run tests either individually or as a group. One way of doing this is to click on the diamonds that the IDE marks in the source file. This screenshot shows an example. The diamonds turn green when the test has been successful, red when failed, and grey when they have not yet been executed. The unit tests for most of the Calculator assignment are in the code snippet below. The tests are simple in structure. 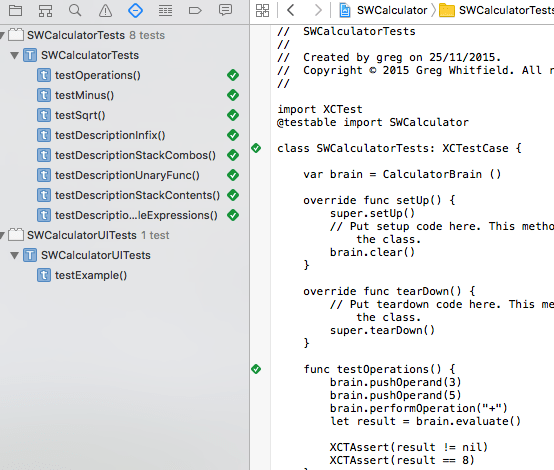 In the test class I create a single instance of CalculatorBrain, and in the setUp() code that gets called before each separate test the CalculatorBrain.clear() method is called to reset its state. One thing I haven’t got is a test case to verify the clear() method – for completeness I really ought to. So that’s it – pretty simple really. I have focussed the testing on the description() method, rather than the correct results from the calculator. That can be a job for if ever the calculation engine needs modification for new requirements. My next job now is to refactor the CalculatorBrain code, ensuring I re-run the unit test framework each time I make a change. This entry was posted in Mobile App Development, Uncategorized and tagged ios, Mobile Development, programming, swift, test driven development, tips, unit-testing by Greg. Bookmark the permalink.